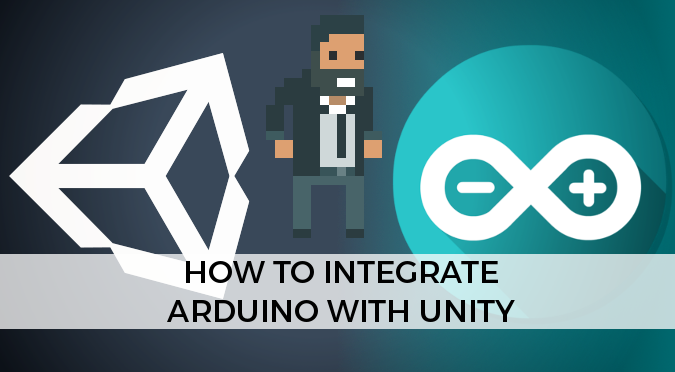 In this tutorial you will learn how Unity and Arduino can communicate using the serial port. This tutorial requires both C# and Arduino scripts; the labels Unity and Arduino will be used to avoid confusion. The communication between Arduino and the PC is mediated using the serial port. This method is the default one to upload sketches, so we’ll be using it also to exchange messages with Unity. If this is the first time you are doing it, you’ll need to follow these extra steps. From Optimization, look for Api Compatibility Level and select .NET 2.0. Unity To initialise the serial port in C#, we need its address (or port) and speed (also called baud rate). While the baud rate is determined by the Arduino code, we cannot chose the name for the serial port. It is automatically assigned by the OS depending on which device and port you are using. Arduino Now that SerialCommand has been installed, we can use it in our sketch. The library allows to specify commands that can be received on the serial port. For this toy example, we want to define a command called “PING”. When we receive such string from Unity, we’ll send a “PONG” back. Let’s start by defining the command; its code will be stored in the pingHandler function. The 9600 used to initialise the serial port represents its baud rate. This value must match the one used in the C# script. Unity Writing a string to the serial port in C# is relatively easy. If there is a problem, WriteLine will throw a IOException (read more here). We flush the stream to make sure the data it sent to the Arduino, without any buffering. Following our toy protocol, we should send a “PING” to Arduino. Arduino As discussed before, the SerialCommand library takes care of reading strings from the serial port for us. To do this, we need to update the loop function. This will write “PONG” on the serial port. You can also use Serial.println to send data from Arduino to Unity at any time. Unity Reading from the serial port is theoretically as easy as writing, since C# offers a very intuitive stream.ReadLine() function. However, there’s a catch. How long do you want to wait for before considering the read failed? If you are waiting indefinitely for Arduino to send data, this might block the execution of your program. Reading from the serial port is, essentially, a system call and can introduce lag. A lot of lag. To avoid this, we should do very quick reads alternated by quick waits. In order to implement an asynchronous waiting mechanism, we have to use coroutines. The code below starts the AsynchronousReadFromArduino coroutine, passing three arguments. The first one is a function (created on the spot) which get the string read from Arduino and logs it. The second one is a callback if the reading fails, and the third one is the timeout (10 seconds). Arduino There are cases in which you might want to send parameters from Unity to Arduino. Let’s do this with an echo function. We can use the function next to get the next argument provided on the serial command. For instance, if we send from Unity “ECHO message”, “message” will be the first parameter. If next returns NULL, it means there are no more parameters. Is very likely that this will overflow the serial port buffer, causing either a crash or a severe lag. What you should do instead is creating a protocol in which Arduino is sending data only when is queried by a “PING” from Unity. This ensures data is always fresh and minimises lags. Last year at GDC a guy approached me and asked my opinion about UNIDUINO, an extension to connect Arduino with Unity. It was only after I said something on the line of “I would never pay so much to use it” that he introduced himself as the creator. Despite this not-so-great start, our conversation highlighted an important issue when it comes to development: how much time are you willing to invest into something? Many software developers have little to no experience with hardware, and they rather spend €32 than a week of headaches to connect Unity to Arduino. To misquote Mike Bithell during his talk at Develop Brighton a couple of years ago, some developers have “more money than time“, If you are going to use an Arduino for your project, you definitely need to invest some money in it. But if you think paying for an extension is out of your budget, this tutorial is definitely here to help. Despite not providing the full range of functions of UNIDUINO, it is surely a good starting point which will suit the majority of applications. The most annoying part of working with hardware is that you’ll constantly need new components to build things. If you are new to Arduino, my advice is to start with the Arduino Starter Kit. It has a lot (I mean… a lot!) of components and it comes with some great instructions. If you have a little bit more experience, you might want to buy the components you need separately. In this case, the Arduino Uno is the “default” option you should go for. If you have already experience with hardware, I advise you to start using Teensy 3.1 instead. It’s a micro-controller fully compatible with the Arduino IDE. It’s compact and more powerful, although it usually doesn’t come with pins. There’s also a Teensy 3.1 Starter Kit which comes with a very bright Color LCD screen. I also suggest a book I particularly liked: 30 Arduino Projects for the Evil Genius. I got it few years ago and it helped me to understand how to use all the most common components. hey, with your code i have problem in unity 3d and arduino, and i dont know how could i resolve them?? i am using the code that you gave us for download in both and I change de port for COM4, bacause in my pc it is the port that use arduino. default parameter specifiers are not permited. Hey! I’ve never experienced this error myself, but it seems is because the version of Arduino you’re using is not fully compatible. Did you try updating the IDE? Did you try including #include in your Arduino sketch? Can you verify the link of your Google Drive account? I can download the files for Arduino and Unity! Hey! I can download both of them. Which problem are you experiencing? I tried your solution but there are error message in both side. ‘arg’ does not name a type. Do you have any idea on what going on? Did you install the libraries correctly on Arduino? Also, did you make sure that the full set of .NET2.0 is included? Glad to have your reply! I had put the ArduinoSerialCommand library under the normal library path, and its example code can be correctly executed, thus I think the library part should be no problem. In Unity, I have change to .NET 2.0. Some stream commend such as stream.timeout, stream.open can be corrected interpret, but only stream.WriteLine(message), stream.BaseStream.Flush(), stream.ReadLine() can’t. I check the error message in google, no explicit answer but point to security protection. I test your code also in windows (in before it was in Mac). In Unity, when choosing the .NET 2.0, all the error messages gone! In Arduino, even though all the example code can be corrected executed, I get the same error message as Sebastian. May I ask which version of arduino are you using? and any special way to place those files? I just try your sample code UnityConnector.ino which already included the #include , and get the error message mentioned above. In my understanding, I must able to run the sample code before adding any new lines. Did you find a solution for the ” ‘arg’ does not name a type” issue? I’m running into the same problem. Which version of Unity / Arduino / Board are you using? This tutorial is few months old. So some things might have changed. Thank you very much for your tutorial, I have been trying to make this work for a while, but I am not sure on how to implement it properly as I keep on getting errors and lag in the connection. I wonder if you would have an example for reading a single analog sensor from the arduino? I have been checking but didn´t find anything. **For Mac USERS** arduino and unity 5.3.5 it works!!! and you will get your address to your arduino port. If you can describe more about the setting on Mac it will be great! Mine doesn’t work even if I change the unity version. However, I eventually find a solution from Pierre Rossel, https://github.com/prossel/UnitySerialPort/blob/master/Assets/Serial/Serial.cs, where he mention a component from uniduino is necessary for “activate” the serial port. how do you test the scripts once you’re done writing them? I’ve downloaded them and uploaded the arduino code to my Uno and attached the c# script to an empty object in a game scene in Unity and nothing happens in the command windows. Hey! I have not tried that, so unfortunately I can’t tell. However there is one thing that I can’t get to work.. I’m only going to use this to have Unity send information to the arduino, so I only did the writing part. And it seems to work fine except for that there seems to be a collision when I want both Arduino and Unity to use the same COM port? Is the COM port in Unity supposed to be the same as the COM port that we select in Arduino Sketch? Because if I do that I get an error in which ever software that I try to have use the port last, telling me that the COM port is occupied. If I choose another COM port then nothing happens when I do the WriteToArduino (“PING”) thing. Also you write that the COM port will be chosen automatically, which I’m not experiencing that it does. Maybe I’m doing something wrong I don’t know. Thanks for the effort put into this! Sorry if there has been any part that was not super clear. When you plug a device, it is automatically assigned a COM port. You cannot decide directly whether that is going be COM1, COM2 or COM10. This is what I meant. Once the device is connected and you know it’s on (let’s say) COM4, then you can safely write COM4. The serial port, in your example, becomes a shared resource. It’s important that you architect your communication protocol so that every time there is a WRITE on one end, there is a READ on the other. If BOTH Arduino and Unity are waiting on a read operation, they’ll both get stuck in a deadlock. Asynchronous communications like those ones are tricky. Is best to have the communication ONE way. For instance… Unity sends commands to Arduino. Arduino NEVER initiates a communication itself. If you want Arduino to send some data, Unity can query it periodically. Then Arduino will have to reply THIS IS THE DATA or NO THERE IS NO DATA. This might not be the most efficient protocol, but is guaranteed you’ll never get stuck in a deadlock. I’m just diving into Unity and C# coding, though, I’ve done a bit of Arduino/C in the past. Super beginner question: how do I use the ArduinoConnector.cs code in unity? Do I attach it as a script to an object? Do I use another script to call it? For what it’s worth I have a super basic read protocol that simply calls sp.readline() from an Object’s Update() function and parses the line into variables – but for reasons you pointed it out there are big flaws. Thanks for your tutorial and for your patience. Okay – So I added the StartCoroutine(AsynchronousReadFromArduino(..)) function inside of a start() function in the ArduinoConenctor.cs file your provided. Then I attached the script to an object. Then set comport and Baudrate to match my arduino. But when I run, I see nothing printed to the console. I’d appreciate any suggestions to get this running. Okay, so now I call Open(); in my Start() function before StartCoroutine(..). Any guidance really appreciated. Perhaps a zipped file of a unity project/scene that correctly uses the ArduinoConnector.cs file. I don’t know if this forum is still active, but I’m getting a lot of Unity errors using this code. Missing namespaces, undeclared variables, etc. Someone who can help me with this? I made a couple of corrections to few types in the code, sorry about that! Is there any specific issue you’re experiencing? The code is provided in snippet, which I know is know ideal. I’m going to second Lewis’s question. Your code is extremely readable (thank you for that), but it’s unclear how I’m supposed to call your Open(), WriteToArduino(), Close() functions. Do I call it from another script? Attach it to an object? When I try to create an ArduinoConnector in another script (where I intend to send different messages based on different conditionals), I too get the “NullReferenceException.” How do I reference ArduinoConnector in another script? Right now, in a separate script, I create a “public ArduinoConnector connector;” Then in Update(), under certain conditions, I call connector.Open(), connector.WriteToArduino(“specific condition trigger”), connector.Close(). Apologies if this tutorial has not been very clear! It was intended for relatively experienced devs. I might re-view it soon, to make sure is still accessible to most developers! Yes, what you are doing is indeed correct. You should create a separate script that runs the logic of your game. The “connector” variable is ok. But obviously you will get a “NullReferenceException”, as that is not linked to anything in particular. To make the connection, you have to drag your AdruinoConnector component inside the slot of your “public ArduinoConnector connector”. I hope that makes it clear! I’m doing as you recommend and calling write and read from a new object in another script. I was wondering how I can call the StartCoroutine function. I would like to ask one simply question. I’m beginner in Unity. I created script for ArduinoConnector and other script where is included “public ArduinoConnector Arduino”. I attached them to new GameObject as scripts and then run the game. After that i get “NullReferenceException” error with this “Arduino”. Could you please tell me what is wrong? Hey Alan Thanks for the tutorial, super helpful. I’m having a little bit of trouble with the signal in unity, I’m getting about as many errors as I am successful readings when invoke the IEnumerator. Any suggestions? Can you tell me a little bit more about the errors you’re receiving? I’m also getting ‘arg’ issue that is not name or type error to complie. Where did you refered it? Is it can be a literal? I can’t found the ‘arg’ member or used as literal ever. I am having trouble using the asynchronous read. After starting the coroutine, it runs once, throws a timeout exception, and immediately calls the Debug.LogError(“Error!”). Any ideas why it is not looping until it runs out of time? I found the problem. The comment says that the timeout is in seconds but it is actually in milliseconds, so my code was timing out after one call. Thanks for the tutorial! I’ve corrected it, thank you! Hey i have managed to get this AND the threading for asynchronous comms working beautifully for my third year project at uni. I do have ONE question though. On unity side, i am sending a “PING” string that is picked up by the arduino’s handler and thus triggering a function. BUT, i want to send an int or float with the “PING” and am having trouble getting the arduino to receive both “PING” handler call, and extra data. I want to trigger the ping handler on my arduino as well as send some information at the same time. Just my luck, i’ve been stuck for a days and i’ve just figured it out. Hi, thanks for the tutorial! So I want to use an arduino to monitor a light sensor and feed the info into unity. When I call the coroutine to read arduino, it gives me one value, and then stops. How can I get it to give me a stream of values in unity? I tried to call the ‘ping’ function inside another coroutine, but that just gives everything a massive lag and gives me a value every few seconds ( I didn’t tell it to wait at all, ie I used yield return null). Thanks! Serial communication is very slow, so is no wonder that it slows down your entire game. Coroutines are tricky because they are NOT executed in parallel. This means that if a coroutine has to wait 500ms for Arduino to reply, it will stop the game for 500ms. I have attenuated this problem by running the check in a real thread, which is something that truly runs in parallel to your code! I hope this solves your issue. If not, please feel free to tell me more about it! Thanks so much! I’ve just left a comment with some questions on over on that post. Im trying to get a basic sphere to move in unity from a force sensing resistor input in Arduino, only issue is I don’t have a ton of experience in C#. Below is the closest I think I’ve come to getting it to work. I believe the issue is in the last few lines of the Unity code, am I properly using the read byte command? First of all, thank you for this, it has helped me immensely. I hope you can help me with my issue. I had everything working perfectly, but later on in my project switched to .NET 4.x and thus lost the .Net2.0 setting as mentioned in your guide. I only switched for a minor thing so when I realized this broke the communication, I switched back. However, this didn’t fix it. I’m writing messages to Arduino but they don’t seem to arrive/work. I have a hard time debugging as I can’t open the Arduino Serial monitor while Unity is running, and there are no errors on the Unity side.